Vivi will be talking with Black Mage No. 288 in the Black Mage village. Vivi will leave, and you'll have control of Zidane again. Explore the village and buy any new equipment, then exit the village. After you choose your party, you will have control of the Invincible, the best airship in the game. Head south from Oeilvert to reach a place called "Daguerro". There's not much to do here, besides a great synthesis shop and a pretty good weapon shop. From the entrance, head left to the next screen. Hit the lower left lever twice, until one of the platforms reaches the ground, then examine the hole it was covering. Now examine the staff on the right (it's lying just next to the levers). Zidane will put it inside the hole. Now hit the lower right lever twice until the other platform reaches the ground, and ride it up to the weapon shop upstairs. Buy anything you want here. Once you're done shopping, leave Daguerreo and head back to your airship. When you ready to go to the final dungeon,enter the portal above IIFA tree. After the following FMV's,you'll encounter a boss battle. Strategy : Your party should be at level 50 or more now,if not,try to gain some levels first.Just keep attacking it as normal,and heal if neccesary. Once the battle is over,your party will be teleported to "Memoria". After doing some talk with your party's,you'll be able to choose your party members.My party's are : Zidane,Amarant,Eiko,and Garnet. 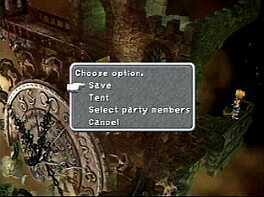 I choose Eiko & Garnet because they can cast White magic to aids the party,or summon.I also choose Amarant,because he's the 2nd strongest character in the game,after Zidane.That's my opinion,but you can choose other party members as well.Once you decided your party members,head north to the next screen.That Rainbow sphere over there is a save point (replacing mognet),so save your game here and continue north to the next screen.Head left to the next screen.Here,go upstairs,then head left to the next screen.Now head north and you'll encounter a boss battle. Strategy : Just attack it as normal and heal if neccesary.Before it died,it will cast a very powerful attack that deal about 2000 damage to the entire party,so be sure your HP is full. Once the battle is over,continue north to the next screen. Here you'll see a small scenario with Quina,Eiko,Zidane,and Garnet. After that,examine the back of the room to get "Angel's Flute",a weapon for Eiko.There's a hidden SAVE POINT just next to the "Angel's Flute". There will be no �!� to highlight it so search around.Save your game here and continue right to the next screen. Here,go upstairs,then head left to the next screen.It's raining here.Head right and Zidane will have some talk with Garnet.After that you'll encounter another boss battle. Strategy : This boss is pretty tough,becasue it can absorb your all of your MP or it will knock off your party members and put them out of commission for the rest of the battle.Just keep attacking it as normal, and heal if neccesary.Bolt 3 works well against this boss. After the battle,examine the lower left corner of the screen to receive "Rune Claws",a weapon for Amarant,then continue north to the next screen. Keep following the path until you've reach a screen with a bell.From here,keep going north until you've reach another screen with the rainbow sphere. Save your game here,and head left to the next screen.Here you'll see a small events with Quina & Zidane.After that,you'll be able to control Zidane again. There's a man hiding behind the pillar on the right. There will be no �!� to highlight it so search around.After talking to him, you'll encounter a boss battle. Strategy : Becareful with it "Curse" and "Doomsday" attack,it will cause a random status effect to the entire party members.If this happen,let Eiko cast Esuna to the party,and let the others cure themself with Remedy.To attack the boss,just cast Holy to Hades,it will do about 7500 damage to him.If you have Amarant in your party,let him Throw "Wing Edge" to Hades.It will do about 6000 or 7000 damage to him.Also, don't forget to steal "Running Shoes" from him. After the battle,Hades will allow you to forge a few powerful armor and weapons. You can also buy Ether from him,so be sure to buy lots of it.Once you done shopping, continue north to the next screen. Now go upstairs and you'll encounter another boss battle. Strategy : There's a three target's here.Try to kill the tentacles first,and concentrate your attack to one target,before attacking the others.Keep attacking him as normal,and heal if neccesary. Note : You can break frozen status by using Fire magic (cast it to your frozen party members). After the battle,continue north to the next screen. There's another hidden SAVE POINT here,in the upper right corner of the screen. Again,there will be no �!� to highlight it so search around.Save your game here and continue to the next screen.Climb up the ladder,and examine the upper left corner of the screen to receive "Mace of Zeus",a weapon for Vivi.Climb up another ladder,and continue north to the next screen.Now you'll reach a screen with three doors. Here you'll encounter another boss battle. Strategy : Becareful with it Quake spell,it will do about 2000 damage (or more) to the entire party.Also,watch out for his Death and Stop spell.Phoenix summon is works well in this battle (to attack the boss, and off course,to revive your death party members),so be sure to have Eiko in this battle.Keep attacking it as normal,and heal if neccesary. After the battle,continue north to the next screen.Now you'll find yourself on an invincible platform (looks like the outer space). Move yourself to the green lights over there,and you'll be teleported to the next screen.From here,keep following the path until you've reach a screen with the rainbow sphere,and save your game here. Now head north to the next screen. Here you'll find Kuja.After doing some talk with him,you'll encounter a boss battle. Strategy : This boss is pretty easy.Just attack it as normal & keep your HP at max and you'll be fine. After the battle,head back to the previous screen,and save your game again. Strategy: Before the battle,first equip Auto-Haste & Auto-Regen abilities on your party,and be sure your party members is in high level. (Lv.55 or above).In the battle,Have Eiko and Garnet in your party and let them heal your party members,by using Curaga or Regen. 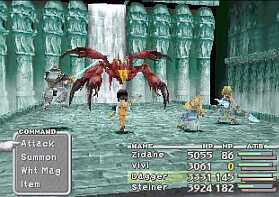 Let the others attack him as normal,and if all of your party members got killed,except Eiko,just summon Phoenix,to revives your party member back to life.Also notice that Kuja can heal himself about 3300 HP.So,be quick and kill him ! *Auction for 12 Dark Matters in Treno. *Use 6 of them when you Kuja. *You'll beat him 4 minutes time. *Now use another 6 Dark Matters when you fight Necron. *You have to be quick.If he cast the Grand Cross magic (Supernova), quickly heal all your character that been affected by any status effect. *If you follow my way you will not been hit by the Grand Cross magic. *You can beat him in 2 minutes. Thanks to "hadith omar" ([email protected])�for the info! Side Quest section. ALl of FF9's sidequests can be foudn here. Ending Pics section. Having a hard time with that final boss? Want to see the ending anyway? We've got full coverage. Chocographs section. Looking for the rest of those Chocographs? See here. Blue Magic section. Having trouble getting all of Quina's Blue Magic? We've got it covered. Card Game section. If you still don't know how to play Tetra Master, or just want a refresher, see here. Images Gallery section. Contains over 500 FF9 pics. IGN - For some english screenshots of FF9. Dingo Jellybean,BabyRyoga,and the other FF9 FAQs writer.Keep up the good work ! Slash4R - For making FF9 story translation guide,so i can understand the story so early. Click here to see the text-only version of this walkthrough. This document is copyright Dennis Hendrys (AKA : Leon Emilio Magnuz) (C) 2000.